I have been fortunate this year to experience a little bit of musical entertainment out on the prairie and from several obedient children and a singing nun over in Austria. While both of those shows were practically perfect in every way (still kicking myself just a little for not getting tickets to Mary Poppins last fall) and I truly enjoyed the shows, I must admit that those experiences have now been slightly, um...overshadowed. If you've seen it then you know that there are no words to adequately describe how amazing the entire production is. If you haven't seen it, well, please rectify that oversight immediately (trust me, you will be glad you did). After an early lunch Saturday at the downtown Spaghetti Warehouse with friends, the girls and I made our way to the matinee showing. There may or may not have been ear-piercing screams as we drove into the parking garage. Yes, we were shamelessly giddy. The next three hours passed in a haze of catchy tunes, witty witch humor, Animal activism, to-the-Nines costumes, spellbinding (ha! get it?) special effects and plenty of pre-Dorothy drama. It was, in a word, perfection. Of course I had to download the soundtrack from iTunes (and I plan to burn a CD for our car) and have been forcing Wicked showtunes down Scott and Annelise's throats sharing delightful music with my beloveds. "Are people born wicked or do they have wickedness thrust upon them?" Maybe I should see Wicked again and again to solve that puzzle. Works for me! 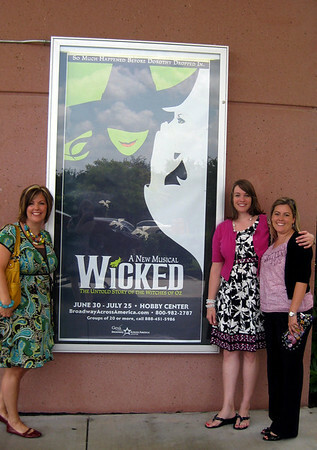 Have you seen Wicked? Which song is your favorite? Are you Team Elphaba or Team Galinda? i saw it in May and love, loved it! i can't imagine how fabulous it was with Kristin Chenowith originally!! Oh I know. HELLO!? Wasn't it just AMAZING!?! Seriously, I still haven't stopped listening to the soundtrack. I listened so much, that my hubby actually went and got a ticket and saw it himself the first couple of weeks we were out here in Utah. He loved it, too. i saw it in may, and it further confirmed that i am Team Elphaba all the way!! oh, and the costumes!! and the musicians!! we learned that in each city, the employ 9 local musicians to fill out the orchestra. they were so good, my sister and i kept looking into the pit to see if they were really playing! 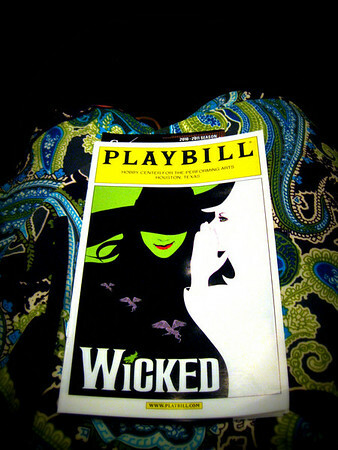 I haven't seen Wicked, but remember rooting for Elphaba after reading the book. Watching these clips makes me want to go! It is magic. I've seen it three times and I cry EVERY. SINGLE. TIME when Elphaba flies and sings Defying Gravity. Took my baby girl with me last month when it was here in St. Louis. It was magic. daughter saw it this weekend. won't tell me about it so won't spoil it if I ever get to see it! she's got the piano music so now hopefully she will introduce us to it too. I saw it a couple of years ago and really enjoyed it. Have you read the book? I liked it very much. I did read the book years ago and remembered liking it, but after seeing the musical I scanned back over the book and was shocked by some of the, um, mature situations I had forgotten and some of the more bizarre characters/story lines. As I scanned I kept thinking, "Did I really read all of this and really think I liked it? ".